Wellbeing is super important. It can be helpful to take some time out of our day and reflect on some of the things we can or need to do to help ourselves feel better. 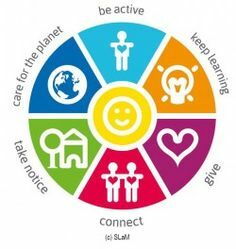 There's a little wheel of wellbeing called the wheel of wellbeing. Each section represents a different way that we can take care of ourselves and our wellbeing. It could be through being active, connecting with others, taking notice of our surroundings and being mindful or learning new things. There's so many different ways that we can help have a positive wellbeing. Check out below for a giant list of all the activities we've done in the past and give one a go! Super excited for this @Jay-RO! I love this idea @Jay-RO! New Years Reflection: Thinking back on the past year, and what we're looking forward to in the new one. Gratefulness Reflection: Reflecting on a few things we are grateful for. Recovery: Identifying a challenge in recovery and how you overcame or are overcoming it. Your Support Network: Thinking about who is in your own support network, and how you can be supportive to others. Random Acts of Kindness: Doing one random act of kindness for a stranger, and sharing about it here (if you'd like to). Personal Strengths: Identifying some of our personal strengths. Appreciating our Surroundings: Taking some time out of your day to walk and enjoy your surroundings. Feel-Good Music: Spending a few minutes enjoying some of our favourite songs. RO's Community Values: Identifying with one (or more!) of ReachOut's Community Values and how you show this value on the forums or in the world around you. Trying Something New: Finding something you've never done but have been wanting to do for awhile, and doing it. Affirmations: Coming up with your own affirmations, or finding some you like and sharing them. Recovery is a Squiggle: Draw and/or share a picture of your recovery "squiggle", remembering to end it going up as we're always making positive progress. Mindful Eating: Picking your favourite food and spending some time eating mindfully, focusing on the senses and thoughts. Appreciating those around us: Thinking about someone you appreciate and letting them know! Keep Learning: Researching a topic you're interested in and sharing 3 things you learn! Give to yourself: Time to treat yo-self and recognise how great you are - you deserve it!! Managing stress: What is something that helps you stay calm in a stressful situation?